Composed of 1.45ct total weight of two different tones of Pink Sapphire. 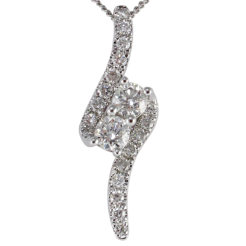 The center of the pendant contains a single cut Diamond that weighs approx. 0.03ct. The Stones are set in a stylish, 14kt Rose Gold.